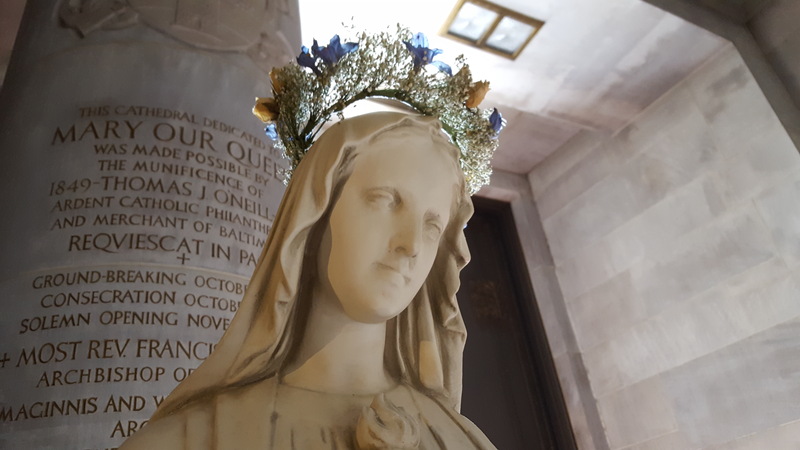 Driving home from work today, I had mind to stop in to the cathedral to chat with Mary. It’s a modern cathedral built in the 1950s, a big place made of smooth stone where you have to walk a city block to get from the front door all the way to the back, to the Mary Chapel . I thought about slipping in a side entrance so I didn’t have to walk so far, but when I pulled up to the church, all of the front doors were wide open. These are enormous and heavy brass doors that I have never seen propped open, even before mass or during special holy days. When I approached, cool air poured out, scented with incense. 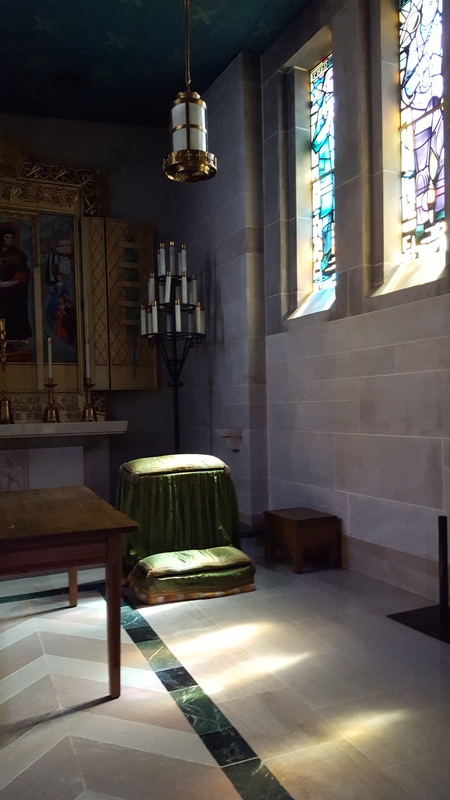 Inside, it was dark except for the light filtering through the narrow, four-story stained glass windows. And I was all alone. Not a soul was in this massive cathedral. Right after work. On a busy thoroughfare. In the middle of a major city on the East Coast. Just me. It made me think of a visit to Poland last spring. Every church I ducked into–no matter the day of the week or the time of day–was full to spilling over with people of all ages. Some had scored seats, others leaned against the walls, folks came in late and other slipped out early. I stopped into enough churches mid-mass to cobble together a whole mass during my week of traveling. 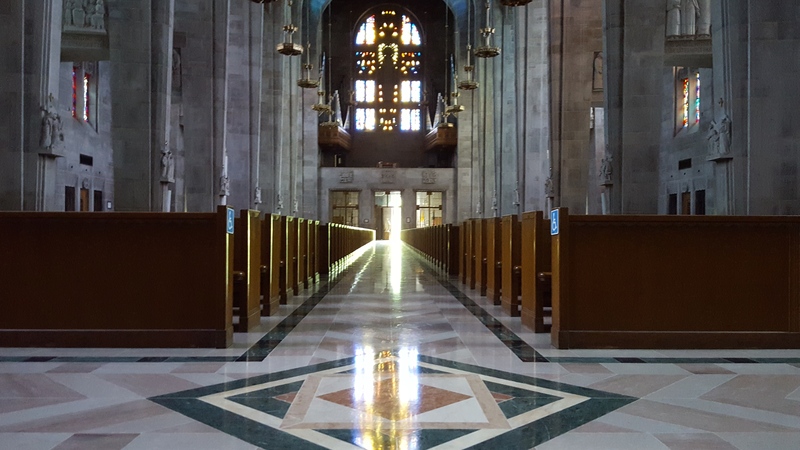 Yet here I was in this massive cathedral–the place where special funerals are held for police officers and fire fighters and revered sports figures, where the archbishop leads Christmas mass to a packed house–and I was all alone with the doors wide open. Is this what it’s like being Catholic in America? I define my very ancestry–Polish, Lithuanian, Italian, and Irish–by Catholicsm. Yet I understand now why so many churches are consolidating and closing. You must have people to have a church. I found the Mary Chapel so quiet in this stone fortress that my ears rang. The silence stayed with me as I traversed the length of the long and quiet church again towards the exit, towards the light spilling through the open doors and into the church. Before stepping back into the sunlight, Mary met me one more time in the form of a statue at the door. She had wreath of flowers on her head and a reassuring smile on her face.